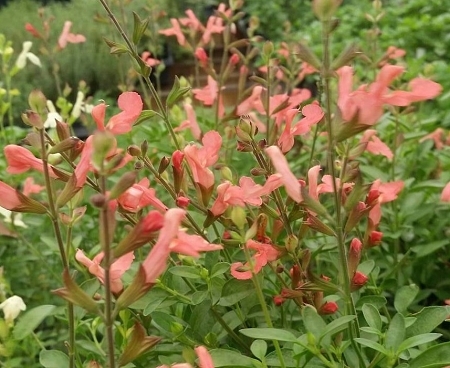 Lowry's Peach Sage (salvia greggii 'Lowry's Peach')- Also called Autumn Sage, this wonderful variety features fruity scented leaves and loads of pale peach colored blooms that hummingbirds adore. Flowers are edible and can be used as a garnish in salads, desserts, etc. Easy to care for plant is very drought tolerant once established, free of most diseases, and reported to be deer resistant. Will bloom non-stop from Spring to first frost. Forms a small bush approx. 3' x 3'. Can be grown in full sun to partial shade. Perennial in zones 8-10. Live plant in 3 inch container.